Yesterday I went to that little flea market here in my town. There was actually a little line when I got there which surprised me. Anyway, I'm so glad I went because look at what I found. A local antique dealer just closed her shop and she had three big tables full of treasures for just $1.00 each! I got all ten vintage frames, four with glass for a buck a piece. I also got the little box, vintage earrings, vintage collapsible cup, pearl necklace and three other necklaces, and the two tin heart ornaments (not old). I got everything pictured here for $21.00. Click on picture for a better view of the cool junk I got. Next, I headed over to a town just down the road as I saw that there was an estate sale going on. I usually don't have a lot of luck at estate sales, but occasionally I get lucky. Usually I am too cheap to pay the prices they are asking, and I wouldn't say that the prices yesterday were fabulous, but they weren't too bad. Here's what I got there. After uploading this picture I realized I didn't arrange things very artfully. Oh well. You get the gist. I love this little pink stool. 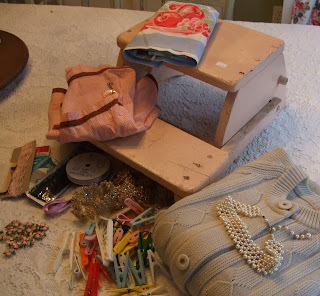 Also found the vintage fruit dish towel, pink and brown apron, bag of trim featuring little pink rose appliques, vintage sweater, little rose & heart necklace, pearl choker, and bag of vintage plastic clips. I got all of this for $24.00. Not too bad. 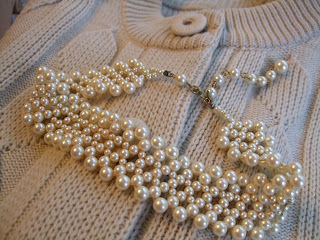 Close up of pearl choker and sweater. I love vintage sweaters and wear them all the time. Usually with a rhinestone brooch from my collection. This one is a neat greyish tan color that I think will look great with a white t-shirt and jeans. All in all, I'm very happy with the short time I spent thrifting yesterday. Later when I checked the mail, I got a package. Oh boy! Don't you just love getting packages in the mail? I sure do! And I was really looking forward to this one as it was from my "oh so charming, itty bitty swap" partner Jo. Yesterday I showed you what I sent her. Well, take a looky at what she sent to me. Everything was so wonderfully packaged, I didn't want to open anything, it was so pretty. Did I mention Jo likes all things French? 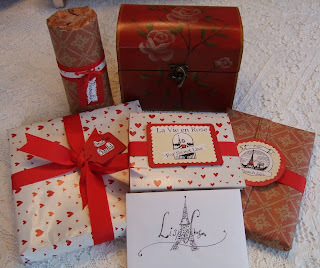 I just loved her little french themed gifts. She even drew a picture of Le Tour Eiffel on the envelope. Just gorgeous. And look at the little rose treasure chest! Wow! She went all out. Here's a picture of what was inside all of those fab packages. 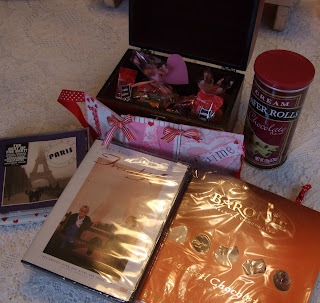 Lots of yummy goodies and dvd of French Kiss, and Paris CD. Here is a close up of the itty bitty valentine Jo made for me. She is really one creative person. I wish she had a blog. Really Jo, I know you are busy with your twins, but you really should have a blog to show everyone how incredibly talented you are. Last night I got a call from the lady at the Polk Flea Market which is being held tomorrow. You may remember me trying to get into it last month with no luck. Well, she called to tell me she has two tables available if I want them so I said yes! That's what I will be doing tomorrow. Selling at the flea market. I do realize that it is Super Bowl Sunday, so hopefully people will still come and want to buy my junk. I will be busy today getting everything together so I can leave here tomorrow at 5:00am. Ugh! Wish me luck! Great finds Lisa! I love everything you got! The title A Thing for Roses drew me to your blog. Pink roses - ah, they're my favorite. I use to think it was white gardenias. I still love them, but no - it's pink roses. Enjoyed your blog. I love all your stuff!! And I have several of those shoe bag thingys. I LOVE them! Yours is beautiful, I would have bought it too! Stop by my blog.........I have something for you!! I've finally got round to completing my weird facts you tagged me to do if you dare look over at my blog!!! You are finding too much fun stuff! I must come along!!!! I loved your blog! I found you on the Halo Hill blog. Beautiful pictures of lots of great stuff. Anita@ The Pink Funny Farm. What antique dealer closed ? I went shopping today w/ Pam and found LOADS of Goodwill treasures and found a really fun store in Albany ! I love the things you came home with ,especially the hearts ! gee-whiz! I want to live in OR where treasure hunting is so great. That pink stool is a sweetie! Have fun Sunday, I hope you sell lots! Wow! That was a great sale! 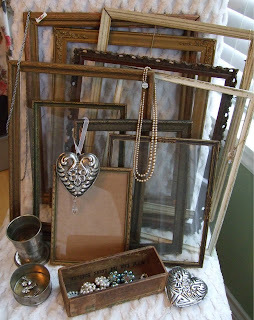 I love those old frames and that jewelry! Hi, Lisa!! Thanks for stopping by my blog!! What a lucky girl you are to have found those lovely treasures!! I hope your flea market day was fun yesterday!! Take care!! A total score on those frames!! Pretty, pretty choker too! You're right, those sweaters ROCK with a t-shirt and jeans!! To my very SWEET swap partner, LISA (A thing for roses): WOOOOOOOOOOOOOWWWWWWWWWWWWWWWWWWWWWW and I'm so thankful for your sweet thoughtfulness!!!! Oh! What a lucky girl to get all those great frames for a 1$ each!